Bill Clinton has nothing on Edward, as he brings warring Edwinn and Barbie together. Edward can look as smug as he likes; I can clearly see that Barbie and Edwinn aren’t *actually* holding hands, so this peace agreement may not hold forever. 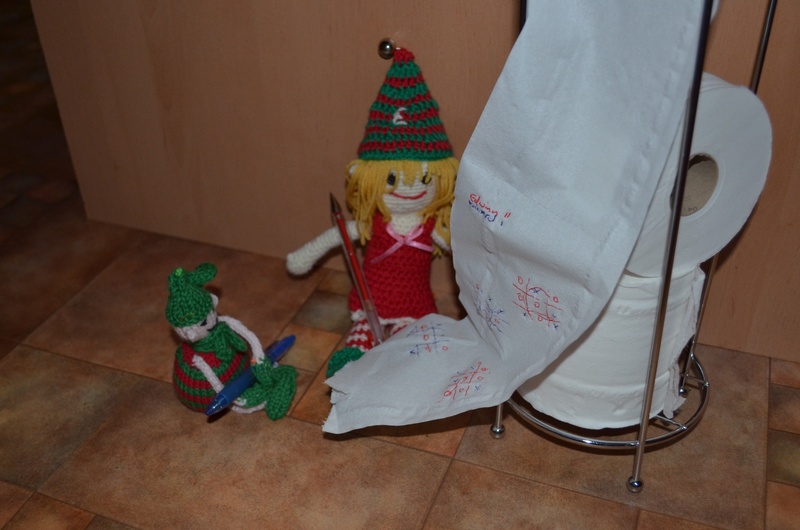 And I’m also ticked-off that those 3 gobbled up my last bittermint before parking their elfy arses on the box. Hmph! 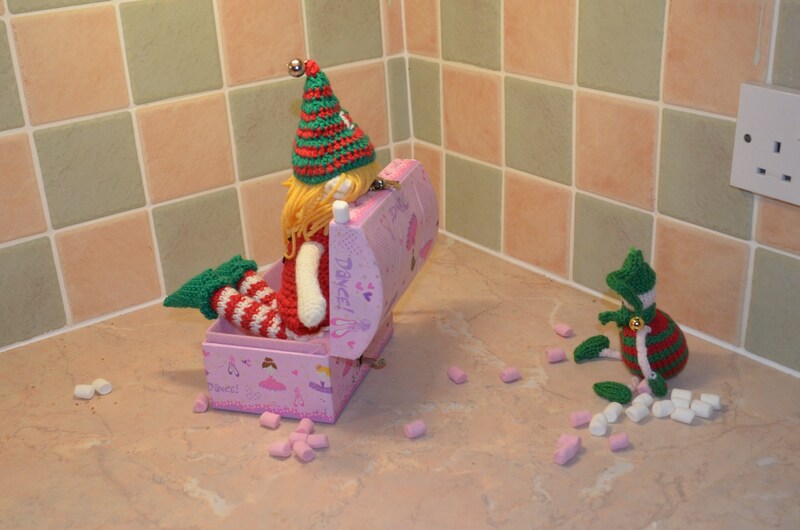 Back to standard, innocent elf fun: marshmallow fights. Originally I had them fighting over the toaster, but when I chucked some marshmallows ‘artfully’ about, half of them ended up inside the toaster – fire hazard!! The morning of the Great Reveal, the minxes helped me clear up the mess. Except Midi scooped most of the now-dusty and -hairy marshmallows straight into her gob. Ewwww! Maxi Minx happened to have a little castle she’d made out of cardboard junk knocking around. As luck would have it, Edward fitted inside brilliantly (see him peeping out the left-hand window?) and big ole Edwinn balanced precariously inside. The girls loved this very much and didn’t want to dismantle the fairy lights. Me and The Boss decided to start to ramp up the anticipation, and had Edward and Edwinn hide in Maxi’s dressing gown pockets. It took the minxes a while to find them. I planted the seeds of “You’re being watched. They might play tricks on *you*!”. We’ll just have to wait and see. 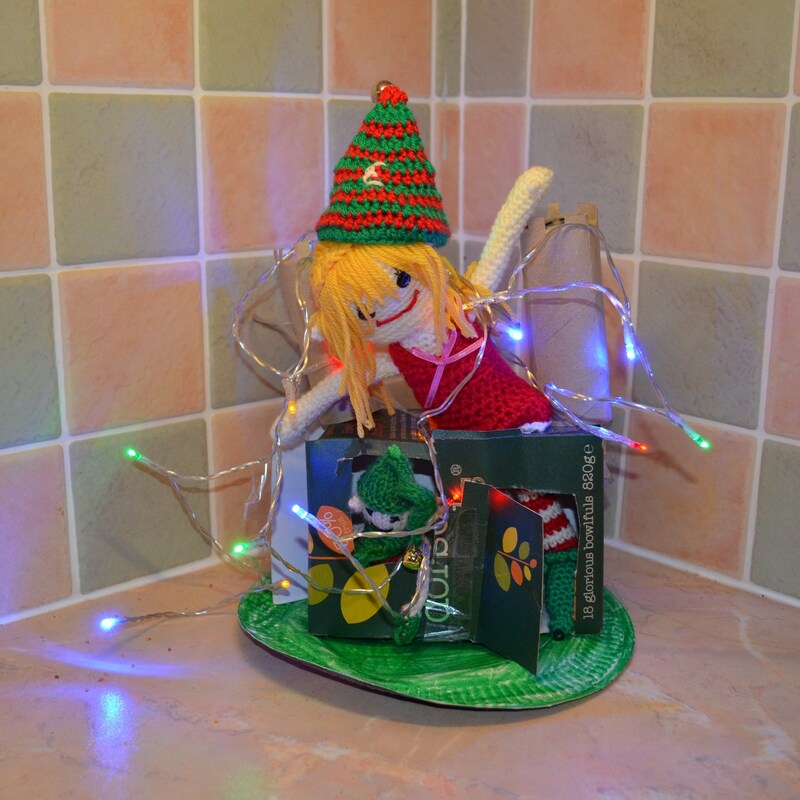 This entry was posted in Christmas and tagged Barbie, Elf on the Shelf by GrumpyOldTrout. Bookmark the permalink.